Bathroom Remodeling | Sarnia | Carosyl Home Additions Inc. Your bathroom is the one room in the home that you are sure to get some time to yourself. The average person will spend up to a year and a half in the bathroom over the course of their lives and visit it on average around 6 times a day. If you are going to spend so much time in a place then it should be the type of place that you want to relax in. How does the bathroom in your Sarnia property look? Does it fit your style and taste? Does it have all the amenities you would like? Is it well built? Do you have enough storage space? These are all valid questions to ask yourself when thinking of how your bathroom can better suit your needs. As a general contractor capable of performing whole house renovations, Carosyl Home Additions Inc. can pretty much change your bathroom in any way you can imagine. Would you like to have another bathroom in your home? Perhaps one that can only be accessed from the master bedroom or perhaps you have been thinking about adding on in the basement or main floor? Adding a bathroom is a great investment that will raise the value of your property as it improves overall convenience. Besides remodeling and renovating there are also a number of additions that our Sarnia clients ask for when they want to improve the functionality of their bathrooms. Medicine cabinet: We can place the cabinet inside the wall you get a flush mirror and extra storage space. Anti-fog mirrors: Wouldn't it be nice to be able to use the mirror right away, even after a hot shower? Anti-fog mirrors do just that and are a great addition to any bathroom. Heat lamps: the infrared lights heat your bathroom to make sure that you have a comfortable temperature when going in and out of the shower or bath. Steam showers: the benefits of a sauna without the added expense. As team shower helps you relax and chase away that winter chill. Retrofitting lights: make the lights in your bathroom more energy efficient so you can save money on your power bill. Not exactly sure what kind of renovation you would like to make to your bathroom? No Problem! As a fully licensed general contractor with more than 30 years of experience, Carosyl Home Additions Inc. can help you at any stage of the process. We can come to your home and inspect the current look of your bathroom and come up with a variety of ideas to fit your budget. We can change around the position of your plumbing to provide the maximum amount of usable space. Alternatively, perhaps there is a bathroom vanity that you have seen in stores that you have always loved and would like us to integrate it into your bathroom. Contact us for all your Sarnia bathroom remodeling needs! If you are thinking of improving your bathroom then we invite you to give us a call or an email. We will work diligently to make sure that you can get the most out of your proposed budget so you get improvements that will not leave you impoverished. Your bathroom is a significant part of your home. It shouldn't feel like a dirty stall at a grungy bar but like a luxury spa. The average time spent in the bathroom is 1 hour and 42 minutes a week, which is almost 92 days over a lifetime. If you spend that much time in one room, it should be as comfortable as your living room. Just imagine, a beautiful jet tub, a classic pedestal sink, blended with just the right colors, add a touch of your favourite scent and voila! Your very own Scandinavian spa! Work with Carosyl Home Additions Inc. for your dazzling new bathroom! Your dream bathroom can become a reality in no time. Just call Carosyl Home Additions Inc.! All contractors at Carosyl Home Additions Inc. are highly skilled in all aspects of full bathroom renovations. Trusted for over 30 years for all bathroom renovations in the Sarnia region, you can call on the experts to turn your plain old toilet and tub into a luxury powder room. The bathroom design will be uniquely tailored to your needs and likes, making sure that you get exactly what you want. Enjoy the luxuries of having the best bathroom remodel in Sarnia! When you team up with the best Sarnia bathroom renovators you won't have to worry about a thing. From design concept to full installation, you will have a specialist with you every step of the way to make sure your dream bathroom is completed on time. No matter your budget, the Carosyl Home Additions Inc. team is happy to set up your new, beautiful bathroom in your Sarnia home. How do you start your day? For most people they roll out of bed and the first room of the house they use is the bathroom. They hop in the shower, brush their teeth, put on their game face, whether that means mascara and lipstick or a clean shave, and then get ready for whatever the day has in store. How do you end your day? You probably run a hot bath, wash your face (maybe even throw on a mud mask now and again) and then brush your teeth before getting into bed, relaxed and ready to drift off to sleep. When you think about your daily routine it's impossible to ignore the fact that your bathroom plays an integral role in the way it all pans out. This is why Sarnia's trusted home improvement firm Carosyl Home Additions Inc. believes it's important to have a bathroom that not only compliments your lifestyle, but improves it. When you're considering remodeling your bathroom there are a lot of different angles you can approach it from. You've got to consider the structural integrity of your space, not to mention putting accessibility and safety measures in place. Is there an issue with water damage, or maybe you're sick of how cold it is when you get out of the shower? Are you concerned with ventilation to avoid mold and mildew? Or maybe you haven't thought about any of that and you're just looking to create a space in your home where you can fully relax. Our team of expert home improvement specialists can help you to identify major concerns you may have overlooked and work to ensure that you don't need to compromise between the bathroom of your dreams and the technical limitations of your space. Not only can we help you to tackle the less exciting aspects of renovation, we can also help you surpass the expectations you had of how luxurious your home-spa can be. For instance, we know firsthand how cold Sarnia winters can be. We also know all about radiant heating. Can you imagine stepping out of a warm, deep bath onto a tile floor that's warm to the touch? Carosyl Home Additions Inc. says let that cold Sarnia winter rage on, you've got a bathrobe to put on! Every project that Carosyl Home Additions Inc. contractors take on is met by quality work and client satisfaction, benefitting you with great service and quality products every time. 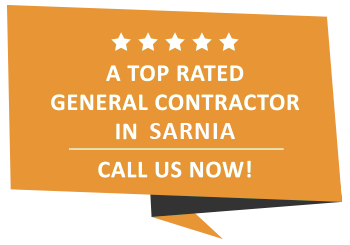 We are the highest trusted renovators in the Sarnia region and that's because we honor the project you give us. Completed on time and within budget, your dazzling new bathroom is just a call away. In case we haven't already blown you away, here are a few other reasons why you should Carosyl Home Additions Inc. and book a consultation with Sylvain Carosyl Home Additions Inc. himself! We are a small company and take pride in all of our work. We offer personalized service tailored to your needs and ideas. You deal only Sylvain Carosyl Home Additions Inc., owner of Carosyl Home Additions Inc. for consultations and designs. There are no salesmen and therefore no extra commissions, which means more money in your pocket! Homeowners love to choose everything that goes into their homes, making it their ideal place. Why not do the same for your place of sanctuary: the bathroom. When working with Carosyl Home Additions Inc., you will be investing in a hassle-free renovation where you will magically see your dream powder room unfold before your very eyes. All your ideas and designs will become reality for your Sarnia home when you chose Carosyl Home Additions Inc.. Call and get that new bathroom now!